William Henry Paine (1828-1890) was born in Chester, New Hampshire on May 17, 1828. In 1848, Paine's family moved to Sheboygan, Wisconsin, where he studied mathematics and trained as a land surveyor. In 1852, Paine traveled to the gold fields of California where he was employed on various hydraulic mining operations. In 1853, he hired on as an assistant for a chain survey of a proposed railroad right-of-way from Sacramento to Utah. During this time he developed and later patented a flexible, flat steel tape measure to replace cumbersome survey chains. Paine's American Tape afterwards came into widespread use in the profession. Paine returned to Wisconsin in 1856 to serve as a county surveyor and railroad engineer. He married but his wife died soon after the birth of their daughter. In 1861, with the coming of Civil War, Paine traveled as a civilian in company with the 4th Wisconsin Infantry to Washington, D. C., where he sought a commission as an engineer. Maj. Amiel Weeks Whipple, chief topographical engineer on Gen. Irvin McDowell's staff, was a principal on the Pacific railroad surveys of the 1850s and was likely familiar with Paine's work. He took Paine on as a civilian assistant to conduct surveys in and around Washington. In early April 1862, Whipple sent Paine into Virginia with several others to fill out some of the many unknowns in existing maps. Paine returned from this reconnaissance with detailed maps and a great deal of useful military intelligence. As a result of his efforts, he was commissioned a captain and A.D.C on April 28, 1862, and attached to the staff of General McDowell, then commanding I Corps. When Maj. Gen. John Pope came east to command the Army of Virginia, Paine was assigned to his staff and with others conducted a full survey of portions of Northern Virginia, "which extended from Manassas south to Rapidan Station." On February 2, 1863, Brig. Gen. Gouverneur K. Warren took command of the Engineer Department, Army of the Potomac, and Captain Paine was assigned as his assistant. Paine performed valuable duties during the Chancellorsville campaign. Paine remained with army headquarters and proved indispensable in guiding the various army corps during the 1864 Overland Campaign. He continued with the Army of the Potomac until the end of the war and was a valued officer on General Meade's staff. A fellow staff officer wrote during fighting before Petersburg that "Paine gave a very good account of the trend of our lines--and was, as usual, the only man who had much general information." During October and November, he was given the very dangerous task of surveying and tracing the Confederate fortifications as closely as possible for addition to headquarters maps. After the war, Paine remarried and relocated to Brooklyn, New York, to survey for the railroad. But wartime associations soon led to work with the New York Bridge Company. When Washington Augustus Roebling succeeded his father as chief engineer of the Brooklyn Bridge in 1869, he hired his former fellow staff officer, Paine, as a construction engineer and later promoted him to Assistant Engineer in charge of the massive cable railway that serviced the bridge project. Paine continued to invent and innovate, receiving a patent for the "Paine Grip" used for cable cars and many other devices. As a recognized civil engineer, Paine consulted or supervised other major construction projects in and around New York City, including the Third Avenue Railway and the Hudson River Tunnel. He also continued his Civil War interests and contributed maps to William Swinton's "History of the Army of the Potomac" and Horace Greeley's "American Conflict," among other publications. 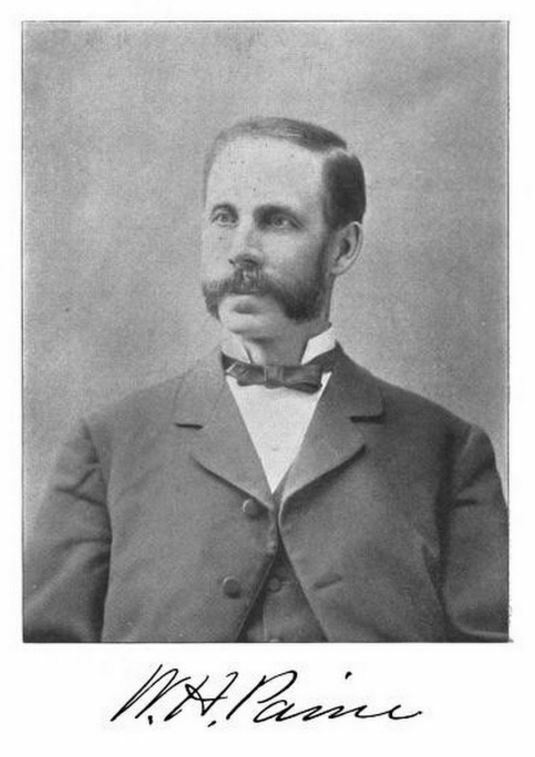 In the late 1880s, Paine moved to Cleveland, Ohio, to oversee a cable railroad project. He died there on December 31, 1890. Paine is buried in Green-Wood Cemetery, Brooklyn. ​William H. Paine, Past Vice-President Am. Soc. C. E., Obituary, Transactions of the American Society of Engineers, 1891, 160-163. Colonel William H. Paine, Obituary, Street Railway Journal, Vol. 7 (February 1891), 95-96. A Guide to Civil War Maps in the National Archives, 2nd Edition 1986, p.68. Derby, George and James T. White. "William H. Paine." National Cyclopedia of American Biography. J.T. White, 1930. Obituary photo, Street Railway Journal, Vol. 7 (February 1891), frontspiece.